Let’s walk through through IndyHall together! We shot a little video earlier this week and I finally figured out how to cut together some stuff in iMovieHD. Check it out, and leave comments/tags! Oh…sorry about the fact that I’m talking crazy-fast…I’ve been drinking a LOT of coffee! We’ve been open all week for free use. Our internet was spotty since we were borrowing a connection from a neighbor until today, when we had our DSL line installed. On Wedneday, we had 15 people working from the Hall and the Philadelphia Inquirer spent about 4 hours here interviewing and taking pictures. Tonight, just 5 days after our first day in the new office, we’re having our first official event, a brainstorming session organized by one of our members for his client. 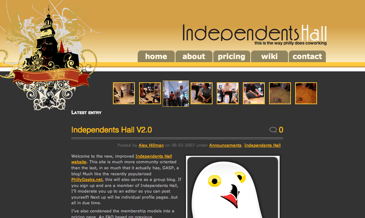 We’ll be videotaping that as well, so expect o see that posted to the IndyHall site. 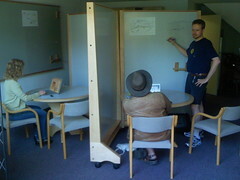 We currently have 15 desks and chairs put together, and next week will be fitting out our lounge and conference room. If all goes well, we have a good deal on digital projectors and other office equipment like that. We’ve got a lot of donated gear too, from furniture and items for the kitchen, lounge, and office supply closet to a recovered server rack for our networking set up. Our free use will roll into membership driven use on September first, but not without a big bash! Keep an eye on our Upcoming Event and RSVP if you’d like to attend the social event. We’ll have an open house all day, and in the early evening we’ll switch over to reception mode, crack open some champagne, and toast, before heading over to our partner bar less than a block away. I hope to see lots of people on the 1st, it’s going to be awesome! 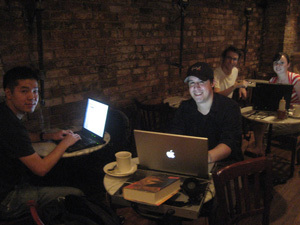 Who would have thought a small town in central Wisconsin would be on the cusp of Co-Working? After a few months of contracting in San Francisco, I was inspired by the “goings on” at Citizen Space. The energy and camaraderie was something missed here, so I decided to create my own “nice place to work” in little ol’ Wausau. Here’s how it happened: While working at an area coffee shop, a local landlord approached me and asked why I didn’t have an office. He’s an old friend, so he offered me a small office that was tucked away upstairs and said it was mine for $100 a month. I told him about the experience I had in SF and how nice it would be to have something similar in Wausau. Then he did something highly unusual – he offered me a top floor office that had been dormant for some time. We worked out a sub-lease agreement where I pay only for the desks that are filled – of which he furnished. He also gave us chairs, tables, fridge, Internet service and free utilities — and HE paid to have it painted! How great is that? A lot has been going on in Philadelphia! Our ever-growing group of creative and independent business people is about to come together to open our first coworking space! We have a bazillion things to do to prepare for signing our lease on August 15th (everything from space planning to purchasing equipment to scheduling broadband installations…nevermind signing member agreements and collecting payments!). We plan to soft open as quickly after that as possible with a grand opening soon to follow. We’ve got a wonderful space in Old City Philadelphia (32 Strawberry Street, map), which puts us in an awesome neighborhood with easy access, lots of restaurants, as well as regular foot traffic. Really, it couldn’t be more ideal! To ring in this excitement, I’ve relaunched our website to now include a group blog, allowing contributions from our members. Our membership plans are posted on the site as well, as well as much of the information regarding our plans. As dates harden, I’ll be sure to post here again so people can attempt to make it down for our opening if they are nearby! This Friday, August 3rd, we are having an office warming and open house at our new Berkeley Coworking site at 2930 Shattuck Suite 305 (cross-street Ashby and near Asby BART Google Map & Street View) in Berkeley, across the bridge from San Francisco. We will starting at 6pm until probably 10pm. Please RSVP at Upcoming. Come see what coworking is about, and help fill our white walls with ideas! 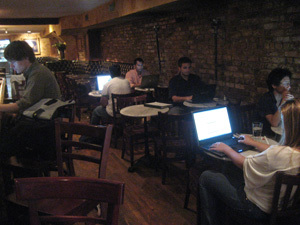 Hey all – been working up a storm here in the East Village setting up the new coworking space in Manhattan at Cafe Fuego (located on 9 St Marks Place, between 2nd and 3rd Avenue). In the past three days, we’ve had a number of people stop by and sit – the staff at Fuego are incredibly nice – and have been incredibly giving to our endeavour. We now have two DSL lines connected for our wiki – one for the back of the space and one for the front – so that people who need bandwidth can be supported. Power is readily available – and people in the past three days have really been helpful in terms of the concept and each other. Traffic is growing – and Fuego is happy to support the effort that they are offering free coffee, tea and juice (limonade) for our community for the next two days. You can order off the full menu – and there are spaces for outside people to come in and work/eat/catch up with you – away from your workspace. We are negotiating with a UPS Store to offer virtual mailboxes and waiting for one of our sponsors to provide a printer and wireless router (due next week). Aside from that, the space is gorgeous and things are moving forward. Please come by and tell us what you think. Next week, we are moving to a paid model – to offset the price for wifi and such. If you have any experience in creating effective pricing models, the team here at CB are always willing to listen. We originally thought somewhere around $20/day for drop-ins with a heavy discount for multiple day/advance purchases. Any thoughts? If you wish to see our daily progress, we are on PBWiki at cooperBricolage.pbwiki.com. (thanks to Dave Weekly!) Come on by and tell us what you think. UPDATE: the CooBric Committee has put up a blog at www.coobric.com (or www.cooperbricolage.com) – please come by and enjoy the conversation. My name is Jeff Kubarych and I am happy to announce the opening of a new Coworking space in Downtown Stamford, CT. located on the 16th floor of the Marriott. I have partnered with The Soundview Club, Stamford’s oldest Business Club, to bring Soundview Coworking to the professionals of Fairfield and Westchester Counties. The space can accommodate 40 to 50 people and has a community computer with internet access, broadband WiFi, an all in one fax/scanner/copier/ printer, several couches and cushy chairs, 2 TV’s and great views of the water and Downtown Stamford (you can even see NYC on a clear day). Free parking is included for all members and we are only a few minutes walk to downtown restaurants, shopping and the train station. We are less than 30 miles away from NYC and welcome members from all Coworking spaces to stop in and work with us when you are in town. We will be launching a wiki/blog in the coming days, but if anyone would like to find out more information, feel free to email me at soundview at gmail dot com or call me at the number below. I have found a prospective site in Berkeley, CA to convert into a small, Citizen Space-sized, coworking office, with room for about 7-8 anchors, and about 400 square ft of meeting/conference room/mashpit common space (good for sessions up to about 25 people). It is near the corner of Shattuck and Ashby in South Berkeley, about two blocks from Ashby BART and Berkeley Bowl, or about 15 blocks south of Berkley BART and the vibrant downtown area. The space is currently tenanted by a technology company that is undergoing changes and is interested in the coworking concept — they want two of the anchor desks, and they already have the lease. I have a lot of nice rolling whitewalls, chairs, and other furniture from Consensus/Alacrity/Skotos, so all we really need to do is buy some common desks (Ikea) and do some cleanup and maybe some painting. If you are interested in being an anchor (i.e. have dedicated desk/file area, a key to get in at all hours, free to schedule conference room area) it looks like a share will be about $400.00 a month, with a deposit of whatever it costs to buy your desk ;-). With the existing tenant wanting two desks, and one for my myself, that leaves 5 anchor spots available. If we can get one or two more people commit to being an anchor, we could move in possibly later this month! Contact me at [email protected] if you are interested or want more information. when elliot winard transplanted himself to nyc, not only did he find a new city, but a new community of like minded folk. if you’ve been wondering what’s it like to cowork, read this great article by Kiera Butler in the New York Post.